Newcastle United have completed the signing of PSV midfielder Georginio Wijnaldum on a five-year contract for an undisclosed fee. Georginio Wijnaldum was PSV's captain last season, he won the Dutch player of the year and led them to the Eredivisie title. 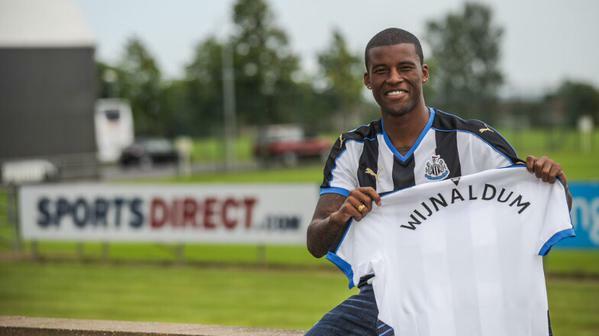 After completing his move, Wijnaldum told Newcastle’s official website: “I’m delighted to be a Newcastle United player. “I felt the time was right for me to move and the club have shown they really want me, so I’m very happy to be here. “There’s a few players here who are from Holland – I know them well and they will help me feel at home in Newcastle. “I know the club has a great stadium with great fans. I want to play here as soon as possible – I want to feel the atmosphere and hear the crowd. He made 152 appearances for the club, scoring 56 goals and providing 18 assists and he is a Holland international.